For fighter info, see Pikachu (SSB), Pikachu (SSBM), Pikachu (SSBB), Pikachu (SSB4), and Pikachu (SSBU). Official artwork of Pikachu and Pikachu Libre. Pikachu (ピカチュウ, Pikachu) is a fictional creature from the Pokémon series. It debuted in the series' first generation, and represents that generation as a member of the "perfect-attendance crew" throughout the Super Smash Bros. series. Similarly to Mario and Link, Pikachu is one of the most well-known video game characters in the world, to the point of being the de facto mascot of the Pokémon series. Pikachu's original artwork from Pokémon Red and Green. 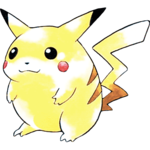 Pikachu is a small, rodent-like Pokémon, and is categorized within the Pokédex at #025 as the "Mouse Pokémon". The extensive variety of Pokédex entries available for Pikachu throughout the Pokémon series provide plenty of biological information, such as how it lives in forests in groups away from people, and how it keeps its tail raised as it monitors its surroundings. 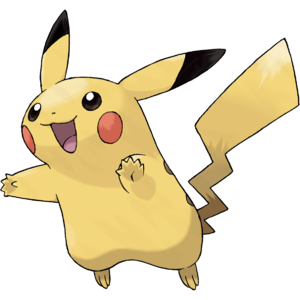 In the core series, Pikachu is a relatively weak Electric-type Pokémon that can be found early in the series' first generation of games: Pokémon Red, Green and Blue Versions. Unlike certain Pokémon that had plot elements wrapped around them, such as Mewtwo, Pikachu was simply a Pokémon that could be readily caught, evolved into a stronger form (Raichu), and had no bearing on the story. However, Pikachu's popularity skyrocketed thanks to the Pokémon anime, where a member of its species became the first Pokémon acquired by Ash Ketchum, the anime's main character. This, in turn, led to the creation of Pokémon Yellow Version, a remake of Red, Green and Blue Versions that is largely based on the anime. In keeping with the anime, a Pikachu is the first Pokémon that the player obtains, and its digitized cry from the previous versions is replaced with voiced soundbites provided by Ikue Ōtani, Pikachu's voice actor. Pikachu's role in Yellow Version was intensely elaborated on, as several events in the game depend on how Pikachu felt towards the player. Depending on the player's actions towards Pikachu, it will exhibit a variety of emotions when spoken to, varying from frustration, to amusement, to complete adoration. As such, Yellow Version became the first game in the series to implement a happiness mechanic, which has since become a series standard. Pikachu's temperament toward the player would also become a prerequisite for certain rewards in the game, most notably the acquisition of all three of the starter Pokémon from Red, Green and Blue Versions: Bulbasaur, Charmander and Squirtle. Following Yellow Version, Pikachu has since been featured in every core series game, and is usually associated with some new gameplay mechanic with each successive installment. It is also readily available to catch in all games within the core series, with the exception of those in the fifth generation (Pokémon Black and White Versions and Pokémon Black and White Versions 2). In Pokémon Gold and Silver Versions, released for the Game Boy Color, Pikachu gained a pre-evolutionary form called Pichu and the Light Ball item, the latter of which doubled Pikachu's Special Attack statistic when held. However, the Light Ball was only obtainable when trading a Pikachu over from the Yellow Version. Pokémon Emerald Version, the solitary follow-up to Pokémon Ruby and Sapphire Versions, granted Pikachu and its evolutionary relatives a signature move called Volt Tackle, an exceptionally powerful Electric-type attack that deals recoil damage and can only be attained by breeding a female Pikachu that holds a Light Ball. Pokémon Diamond and Pearl Versions for the Nintendo DS introduced cosmetic differences between genders for certain species of Pokémon, with Pikachu being among of them; in Pikachu's case, females have a dent at the tip of their tails. The Light Ball was also improved, as it now doubles both Pikachu's Attack and Special Attack stats. Pokémon X and Y featured Ikue Ōtani reprising her role as Pikachu for the first time since Yellow Version, a change which has since been retained in the core series. Pokémon Omega Ruby and Alpha Sapphire, the remakes of the Ruby and Sapphire Versions, introduced Cosplay Pikachu, a female Pikachu that can wear costumes that correspond to the five contest conditions and grant her a respective move that her species cannot normally learn. Pokémon Sun and Moon introduced Z-Crystals, two of which (Pikanium Z and Pikashunium Z) are exclusive to Pikachu, alongside a Pikachu based on Ash's that can wear one of his numerous hats. Most recently, Pokémon: Let's Go, Pikachu! and Let's Go, Eevee!, remakes of Yellow Version, feature a Pikachu and Eevee as partner Pokémon. In comparison to previous starter Pokémon, the partner Pikachu/Eevee have various traits that make them notably distinct from other members of their respective species. Pikachu has also been featured in virtually every Pokémon-related spin-off game ever released, sometimes as a main character or merely being featured among the hundreds of other Pokémon species. Notable Pikachu-centric games include Hey You, Pikachu!, where the player can talk to Pikachu using the Voice Recognition Unit; Pokémon Channel, which is usually regarded as a spiritual sequel to Hey You, Pikachu! ; and the PokéPark series, which features a Pikachu as the main character. The Pokémon Mystery Dungeon series has also consistently featured Pikachu as one of the Pokémon that the player can start out as. Pikachu has also appeared in the Tamagotchi-style virtual pet simulator Pocket Pikachu, which is a small LCD device that owners can clip onto their belt. Whenever the user takes a step, it will register on the system, which will give Pikachu points in the form of "watts". Much like its fighting game appearances in the Super Smash Bros. series, Pikachu is one of the playable Pokémon in Pokkén Tournament and its enhanced version. While the initial arcade release features a presumably male Pikachu, Cosplay Pikachu (wearing her Pikachu Libre costume) was later introduced as an additional character with a different moveset. Pikachu has never been good in competetive play, owing to its low defenses, mediocre speed, and status as a not-fully-evolved Pokemon. Furthermore, the items Light Ball and Pikanium Z do not compensate for its low offenses because of its average speed. 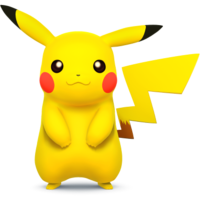 Official artwork of Pikachu in Super Smash Bros.
Pikachu's debut in the Super Smash Bros. series is as one of the eight starter characters. 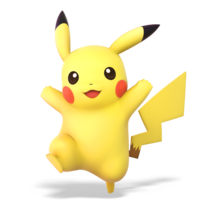 Just like in its home series, Pikachu is a small, fast character whose playstyle is prominently dependent on its speed and powerful electrical attacks. Pikachu's neutral special move, Thunder Jolt, emits a bolt of electricity that bounces along the stage. Quick Attack is Pikachu's up special move and while it's not capable of damaging, it grants a huge recovery distance. Lastly, its down special move, Thunder, involves Pikachu striking itself with a thunderbolt that blasts anyone else standing in the way. Pikachu is considered the best character among the SSB competitive community and is ranked 1st on the tier list, placing it in the S tier. Pikachu, as it appears in Super Smash Bros. Melee. Pikachu returns as a starter character. While its playstyle is still incredibly similar to its first appearance, Pikachu was nerfed in Melee but still holds up at 9th out of 26 on the tier list, ranking at C tier. It has gained Skull Bash as a side special move, and possesses a respectable mix of speed and power. It's safe to say that Pikachu is the most famous and popular of all Pokémon. It has electric pouches in both cheeks; when in danger, it shoots electricity at its enemies. Although Pikachu can evolve into Raichu by exposure to a Thunderstone, many trainers like Pikachu so much that they don't let it evolve. 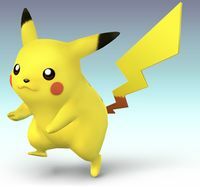 Pikachu, as it appears in Super Smash Bros. Brawl. Pikachu returns as a starter character in Brawl. Visually, Pikachu has barely changed at all from its Melee design, only being touched up slightly. While it's position on the tier list isn't much of an improvement from Melee, Pikachu was considered to have been buffed in Brawl, becoming more powerful and gaining many new techniques such as Quick Attack canceling and two chain grabs in exchange for mainly weaker knockback in its attacks. Pikachu is ranked 8th on the tier list, placing it in the B tier. Like the rest of Brawl's cast, Pikachu possesses a Final Smash, a new kind of special attack that debuted in Brawl. In Pikachu's case, its Final Smash is called Volt Tackle, which involves it generating a giant ball of electricity around itself that can be controlled by the player in order to slam into and/or shock the opponent. A Mouse Pokémon. Its lightning-bolt tail and round cheeks are its trademarks. When danger draws near, it uses tiny electric pouches within its cheeks to discharge electricity. When it's really fired up, it unleashes thunderbolts on its rivals. It's said to recharge when it's sleeping. It evolves into Raichu. 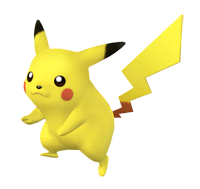 Pikachu, as it appears in Super Smash Bros. 4. Pikachu returns as a starter character, with its design having been updated to appear in line with its more recent appearances. Pikachu is ranked 15th on the SSB4 tier list. Pikachu received some nerfs in the transition from Brawl, such as its powerful down throw and forward throw chain grabs (which were a large part of Pikachu's previous success in Brawl) being removed, and lower damage outputs on some moves. In return, Pikachu benefits from the changes to hitstun canceling, which improve its combo game by enabling its attacks to chain together easier. Some of its attacks' ranges and KO potentials were also improved. However, Pikachu suffers from poor endurance, and has a general lack of reliable KO options. Despite having a small playerbase in the competitive scene, Pikachu still gained a bit of success in the metagame from a few players. Recognized the world over, Pikachu is an Electric-type Pokémon that stores energy in its cheeks for use in battle. In Smash Bros., Pikachu is a well-rounded fighter with speedy, powerful electric attacks. Quick Attack can be used twice in a row if two directions are input, one after another. Pikachu is famous worldwide as the face of the Pokémon series. There's a lot of electricity stored in those rosy cheeks, and in this game, that allows for some devastating attacks, like Thunder Jolt. Tip: Input another direction after using Quick Attack to get a second burst. It's top-notch for recoveries! Pikachu's Thunder Jolt fires off a ball of electricity that bounces across the stage, getting weaker as it travels. It does more damage to enemies in the air. The default down special, Thunder, causes a lightning strike that both shocks opponents and turns Pikachu invincible for a split second. Pikachu's Thunder Jolt fires off a ball of electricity that bounces across the stage, getting weaker as it travels. Airborne enemies will take extra damage from it and get launched further. The default down special, Thunder, causes a lightning strike that both shocks opponents and turns Pikachu invincible for a split second. Pikachu, as it appears in Super Smash Bros. Ultimate. Pikachu returns as a starter character in Super Smash Bros. Ultimate. 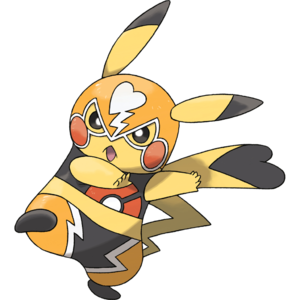 For the first time in the series, Pikachu now has female variants to choose from via alternate costumes, one of which is Cosplay Pikachu wearing her Pikachu Libre attire. Partner Pikachu Support Pokémon: Let's Go, Pikachu! Pikachu Libre, as she appears in Super Smash Bros. Ultimate. Due to Pokémon Yellow Version, Pikachu is technically the first playable starter Pokémon. Pikachu and Charizard are the only playable Pokémon that are game mascots. Pikachu is the only playable Pokémon in the Super Smash Bros. series to have a visible gender difference. Male Pikachu look like the one in the Super Smash Bros. series, while females have a dent at the tip of their tails. However, gender differences in the Pokémon series were introduced in Generation IV, which debuted well after SSB and Melee did. Given this, and the fact that its alternate costumes include hats worn by male characters, the Pikachu in the Super Smash Bros. series is commonly perceived as male. In addition, Ultimate gave it two distinctly female variants via alternate costumes. Despite this, Pikachu is not listed under a specific gender, as Nintendo and its affiliates primarily use gender-neutral pronouns for all Pokémon, regardless of a species' appearance/gender ratio or lack thereof. Pikachu is the only character in the entire Super Smash Bros. series to have only four alternate costumes in the first three Super Smash Bros. games. It has eight alternate costumes in SSB4, just like every other character aside from Little Mac and the Mii Fighters. As of the current tier lists for each installment of Super Smash Bros., Pikachu and Fox McCloud are the only characters who are ranked no lower than the upper portion of the mid-tier, and have also been at the top of a tier list before. Pikachu is the only Pokémon to be a starter character in every Super Smash Bros. game. Pikachu's poses for its Classic trophy in Melee and its official artwork for SSB4 are based on the sprite of Red's Pikachu from Pokémon Yellow Version. Despite being a move that causes recoil, Pikachu does not take damage from using Volt Tackle. Both Pikachu and Jigglypuff are the most recently introduced characters at the time of Smash 64's release date. This page was last edited on April 18, 2019, at 09:22.